You know what they say about fools and their money? Well, over in Japan that will probably count double if a new ringtone download service hits the particular niche market it's aiming at – pet dogs. 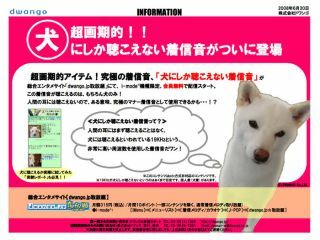 Dwango, which provides a huge range of normal ringtones for a fee, has just started offering a range of downloads that gives NTT DoCoMo mobile phones rings that only dogs can hear. The company's marketing literature doesn't even bother trying to explain what the point of such a thing is, and we're certainly not going to speculate. Nevertheless, doting doggie types wishing to get their hands on the 19KHz audio files are encouraged to sign up for Dwango's flat rate package that allows them free run of the company's library including, presumably, some tones they can actually hear with their inferior human ears.